X: Put a creature card with converted mana cost X or less from your hand into play face down as a 0/1 creature. 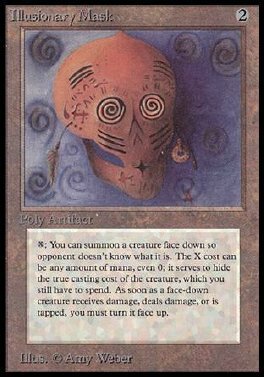 Put X mask counters on that creature. Play this ability only any time you could play a sorcery. The creature's controller may turn the creature face up any time he or she could play an instant by removing all mask counters from it. This effect ends if the creature is turned face up.